My partner Susan and I were driving to the San Diego Zoo last week and we drove through the route of the San Diego Gay Pride Parade. We started talking about maybe changing where we sit this year and in that conversation we then decided that we couldn’t do that because we’ve been sitting in the same spot for 10 years now and that kind of makes it a tradition! I found as we were talking that my heart was just filled with emotion, and my spirit was lifted just remembering my first Pride Parade 10 years ago. Gay Pride Parades aren’t just about gay men stomping about in tight short shorts and dykes riding their motorcycles in leather pants and no tops! Not that there’s anything wrong with either one of those things, and the motorcycles are certainly worth looking at, but, it’s really about so much more. Ten years ago, I was 50 years old. My life had been spent in hiding and had been filled with so many lies and so much hurt and anger, I never imagined there was a way out. More specifically, I never dreamed there was a way for me to come out. But – there I was – this 50 year-old Lesbian, sitting on the corner of 6th and University in San Diego waiting to see my first-ever Pride Parade. I was a stranger in a strange land – and yet I felt more at home on that street corner than I had ever felt in my home-town. My move to San Diego and to Susan had been filled with doubts and fear and oddly, this great sense of relief that I was finally away from most of my family who had then, and still have now, no tolerance for “the gays.” It goes against what they believe are their fine Christian values. I had started a job here in San Diego at the La Jolla Playhouse that had placed me exactly where I needed to be to understand that being gay was not the end of the world – it was in fact the beginning of my life. Friends like Candie, Thom, Terry, Jenny, Gigi – all openly gay – all living this life I had only dreamed of, showed me on a daily basis how life is just life and who you love and can never, ever be questioned or regulated. 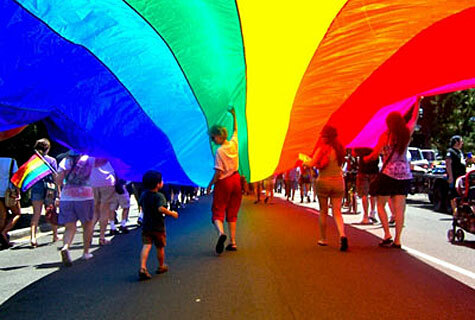 The Parade was filled with floats and bands and organizations walking the walk of gay pride openly, without fear. Policeman, firefighters, churches all showing pride and banners for tolerance and acceptance. It was nothing I had ever seen or heard in my life. I clapped, I laughed, I cried. At the end of the Parade there is this huge rainbow flag that people put over their heads and walk under it down 6th avenue to Balboa Park. The flag must cover a full city block. It was an amazing sight to see. Susan insisted I get under this flag, grab hold of it and walk the remaining blocks to the park. I whined – it was hot – I was tired – blah, blah, blah – Susan insisted. The moment my hand touched that flag I started to cry, and I cried the entire way to the Park. I cried for the 50 years that I lied about who I was, I cried for the freedom I was now feeling, I cried for the peace that had entered my heart, I cried for finally, finally understanding and accepting this person I had become, I cried and cried and cried. Every year we go and sit in our spot on the corner of 6th and University. Our granddaughter usually joins us along with our close friends, and neighbors. We yell and run into the street and hug our friends who are marching with the military folks, and our friends who are walking with their church. Susan was right; The Gay Pride parade had changed my life.